The Satellite range of Toshiba laptops have built up a reputation as the most reliable machines available. They are immensely popular for education and business but are equally valuable for home users. A Toshiba laptop is similar to a Toyota Hilux truck. Virtually indestructible and supremely reliable. These machines will never let you down and are perfect for busy users who rely on their computers when out on the road. And there is a Toshiba laptop to suit everyone no matter what their requirements are. The entry level Chromebook is perfect for those who love their Google apps but for business users and mobile workers the Tecra or Portege machines are ideal. And whether you are looking for a convertible or a of the range ultrabook Toshiba make the ideal machine for you. High speed Intel and AMD processors power Toshiba laptops and with many featuring super-fast SSD drives and graphics cards these machines deliver exceptional performance. This power combined with Windows Professional operating systems combine to make Toshiba laptops the ultimate machines for anyone looking to boost their productivity whilst managing a heavy workload. Whether you will be using your machine for work or for leisure, or even as a study tool, you wonÃƒÂ¢Ã¢â€šÂ¬Ã¢â€žÂ¢t be able to find a more reliable laptop than a Toshiba. 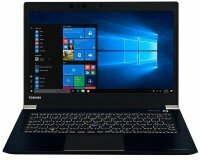 Check out the full range of Toshiba laptops available on Ebuyer and take advantage of the great deals and low prices.